We cannot have a democratic society without accountability. Leong Sze Hian. The foundations of a democratic society, arguably, are transparency and accountability. Can we build a democratic society when there is a lack of these ? Whilst Singaporeans have over the years called for the government to be more accountable on various issues, perhaps the most contentious is that pertaining to our reserves. In the reports, “CDCs urged to enlist more helping hands” (ST, Jun 30) and “Temasek helps local needy” (ST, Jun 26), the number seeking financial assistance has increased by 40 per cent, and those seeking help with jobs doubled, from October last year to April this year. In May 2007, Temasek launched the Temasek Foundation with an initial endowment gift of S$500 million. In June, Temasek announced the establishment of Temasek Cares CLG Limited (Temasek Cares), an Institution of a Public Character that will focus on supporting the community in Singapore. Temasek Cares said that it has received a S$100 million endowment from Temasek Holdings, and hopes to spend about S$2 million a year. Temasek’s funds and assets are originally derived from the Singapore Government, and these indirectly belong to the citizens of Singapore. Do other Government entities create philanthropic activities? The answer I believe, is no. Why? Because in my view, money which belongs to the government and the people, must be accountable to the people. Thus rightfully, only governments can make decisions of philanthropy as governments would be accountable to the people through Parliament. In the case of Temasek, not only are its returns somewhat lacking in transparency, there is also a lack of accountability to Singaporeans in respect of its philanthropy. According to its web site, 11 of its past 12 programmes were focused primarily on citizens of countries other than Singapore. Why have almost all its projects in the past been focused on citizens in other countries, and why did it take so long for it to start helping needy Singaporeans? This begs the question – why set aside $500 million for foreign projects and why is only $100 million set aside to help Singaporeans? And even this is limited to S$2 million a year. How much of the approximate $1 billion that Temasek Holdings has committed and contributed to the communities in Singapore and around Asia since it was set up in 1974 was used to help needy Singaporeans? By the way, according to the article, “Sovereign wealth funds suffer sharp falls” by the Financial Times, on 21 July, Singapore’s Government Investment Corporation (GIC) has an estimated US$350 billion under management, and sovereign wealth fund portfolios have contracted 18 per cent since the end of 2007. If Singaporeans have to rely on foreign newspapers to guess the amount of our reserves and its losses (note : Temasek’s last reported returns was only until November 2008), we “sure have a long way to go”, to becoming a democratic nation, with transparency and accountability! 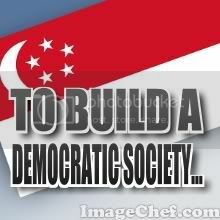 Finally, I would like to agree with the Minister Mentor’s recent remarks that Singapore is not yet a nation. For a nation to not know how much and what constitutes our reserves is one thing. Not being able to question how they are used and to what extent to help needy Singaporeans, vis-à-vis foreigners, is something else altogether.